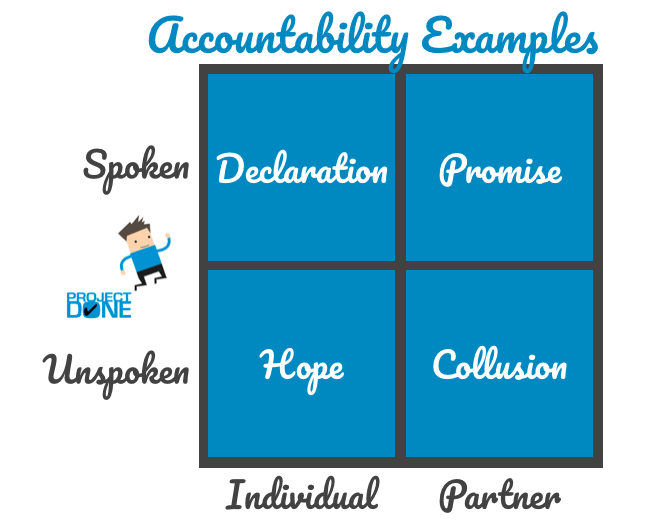 What do we mean when we say ‘accountability’? I believe ‘to be held to account’ is an important management idea, except it’s almost become a cliché. Or, as political writer Don Watson might have called it ‘a weasel word’ – a concept we use to mask over what’s really going on. The definition of ‘accountable’ makes it sound almost like a legal obligation, a justification or blaming of responsibility. Given this flavour, it’s not a surprise that so many people run away when the thought of being held to account is raised. Yet the benefits are enormous – we give ourselves a much greater chance of success and achieving our goals when we partner with another person to be held to account. At a simplistic level, peer group pressure is a powerful force – We can get more done together. For me, I prefer the last one: ‘’duty bound’ because it speaks to the obligation through the lens of ‘respect’. It implies ‘moral’ obligation rather than ‘legal’. The fundamental design of accountability is based on a statement of intent and the making of a promise. 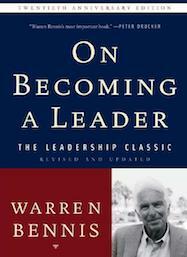 It begins with what Warren Bennis, in his classic book On Becoming a Leader, states is the starting point for leadership: the declaration that ‘I want to make this happen’. The second step is to make a promise to ourselves, or ideally, to another person. We keep ourselves accountable – While we might think this is the ideal (that we can go it alone) this is more difficult that it seems. In Project Done, I play the role as facilitator of the group to complete their projects (and my own project also). While most people say they join to ‘learn’ the content I have to deliver, many at the end of the program say the most powerful part of the program was the ‘accountability’ – having to admit to the group publicly each week whether they achieved their intended target or not. Results – The participant declares whether they hit their target or not. It is important that they claim their results. And we do this by asking if they are ‘green’ or ‘red’ for the week. ‘Going green’ means you met your target, ‘going red’ means you didn’t. We then show a visual display or an Accountability Scoreboard over the course of the program to track who is on target and who is not. It’s amazing to hear people language their efforts, as ‘I definitely wanted to go green this week’. This approach holds people to account with a light touch and with an emphasis on learning and growth. While one might presume the leader is the person holding the other to account, this is not necessarily true. And depending upon the situation, as long as respect is maintained for both people, a senior leader could be held to account by someone less senior. How do we hold someone to fulfill his or her duty? Use this three-step guide to manage your accountabilities in a simple and effective way. An accountability agreement starts with the declaration of a commitment or intent. “I want this to happen.” And an agreement is then made that the other person will keep you to your word. This may require a conversation as to what this specifically means in practice. For instance, ‘Am I going to follow you around 24 hours a day to make sure you do/don’t?’ Let’s hope not. 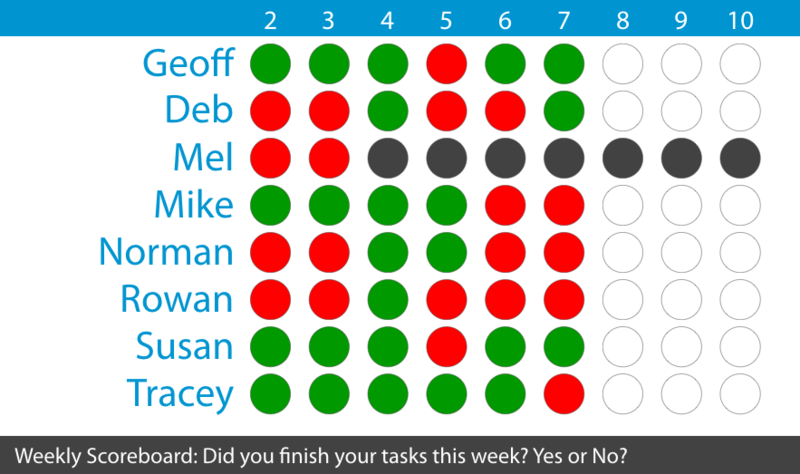 More likely, as in Project Done, you will set up a reporting process and time frame, eg I will publicly report my results each week in our meeting. 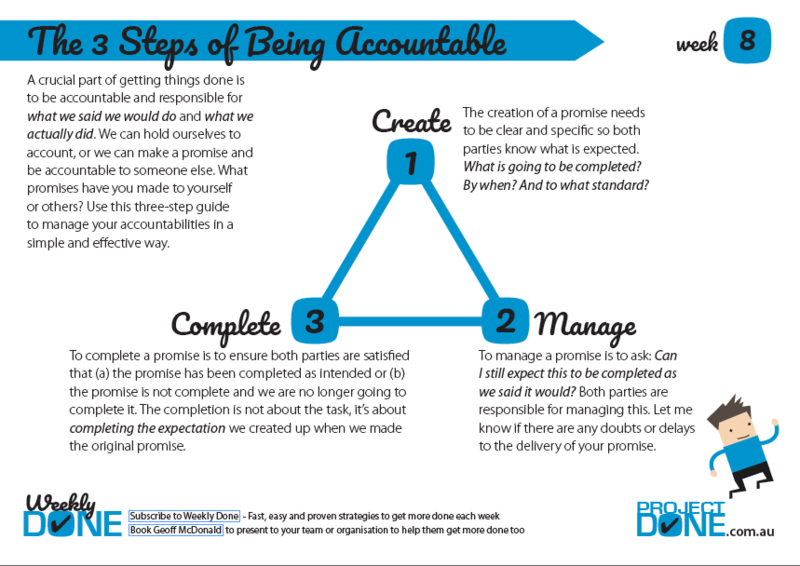 To manage accountability is to manage a promise. You’re consistently asking: Can I still expect this to be completed as we said it would? Both parties are responsible for managing this. This is crucial. It’s not one party being the policeman. It’s both parties working together to help each other achieve a shared result. And part of the communication cycle needs to include any doubts, concerns or delays that may impact on the delivery of your promise. One thing to avoid is to wait until something happens before reporting on it. A better approach is to use your radar to alert each other to your concerns and adjusting where needed. The accountability agreement will end at some point – ideally, as a constructive conversation. To complete a promise is to ensure both parties are satisfied that (a) the promise has been completed as intended or (b) the promise is not complete and we are no longer going to complete it. The completion is not about the task; it’s about completing the expectation we created when we made the original promise. Accountability is the cornerstone of collaboration, leadership and working together as a team. It requires both parties to form an agreement and support each other to fulfill a result. Through the lens of being ‘duty bound’ to each other we can forge powerful relationships that also deliver outstanding results.